These are muscles that contribute to an agonist or prime mover muscle’s function via reducing movement of some related bone. 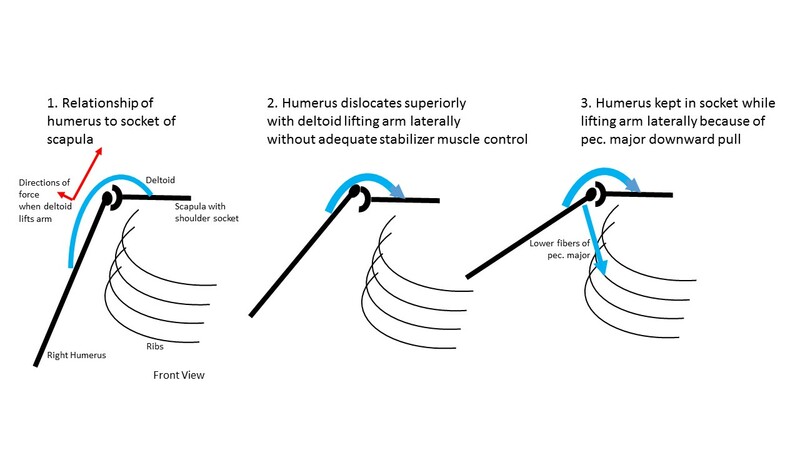 The ‘stabilizer muscle’ term is most often used in the context of action on the same joint(s) as the agonist but the term can also be applied on distal, functionally related joints. In either case, stabilizers do not directly contribute to the agonist’s movement of a bone, but they do contribute to the total power output and control of a movement. Every joint involved in golfing uses multiple stabilizer muscles. Let’s see some examples. time you did a backswing. 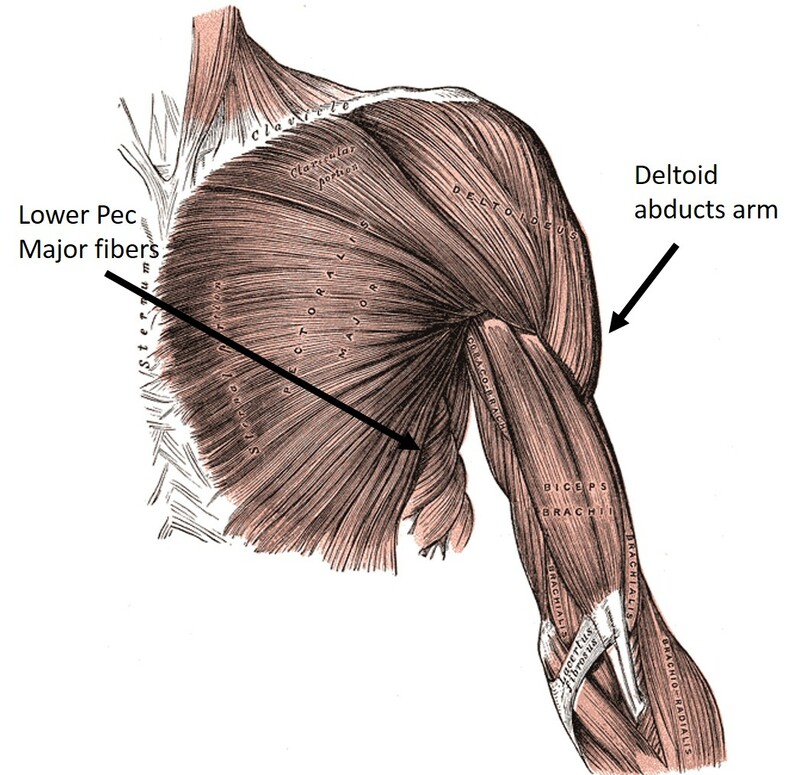 Fibers of the lower portion of the pectoralis major and to a lesser degree, the teres minor muscle work to pull the head of the humerus down, keeping it in the shallow socket, at the same time as the deltoid is pulling the arm backward. 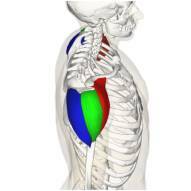 In this example, the pectoralis major is a stabilizer muscle. How does this manifest in sports? 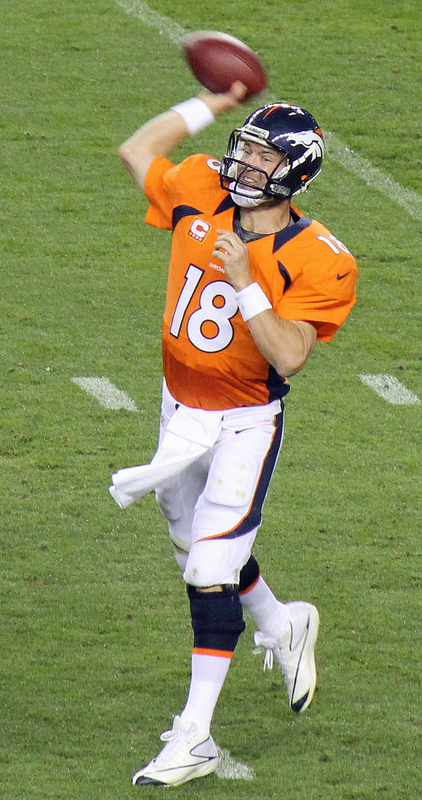 For a football quarterback throwing a ball, they straighten their arm rapidly to push the ball forward off of their hand. The shoulder end of their humerus is also pushing in the opposite direction as the arm straightens. It is only by having a relatively stable scapula attached to a fixed torso which allows all the force to go forward into the ball. 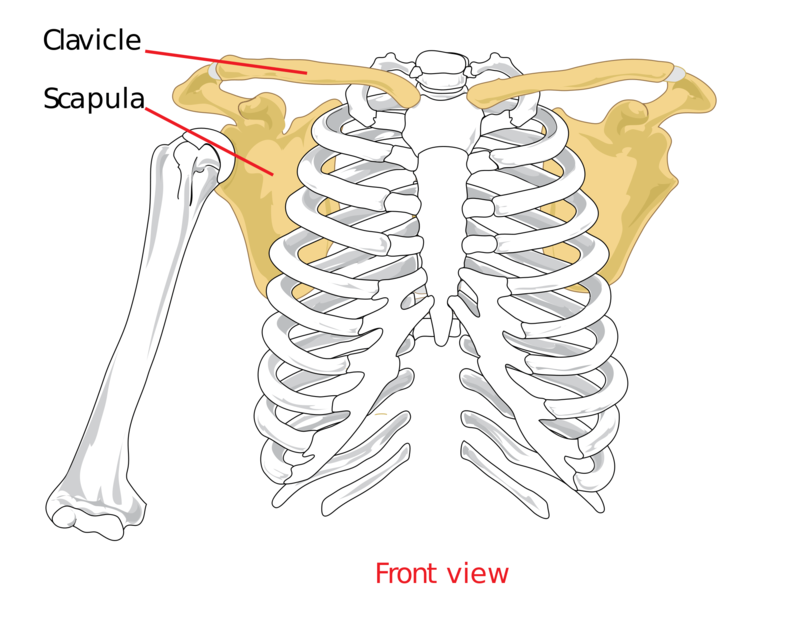 If the muscles holding the scapula to their torso are weaker than the forces being exerted on it by the arm straightening muscles, some of the force will cause their scapula to stretch backward. This results in some percentage of the force being generated by straightening their arm going into scapula movement rather than propelling the ball forward. In other words, weak scapula stabilizer muscles result in the ball traveling slower over a shorter distance. This loss of effective power being delivered to the target in golf (the club and ball) because of weakness in a stabilizer muscle of a related joint can happen anywhere along the kinetic chain of a movement. For golfers, power starts at the points where cleats push against the ground. Some force can be lost by not having cleats and being on slippery ground. In this case, the rear foot would slip backward during the swing. In a similar manner, weak ankle stabilizers will results in the foot bowing outward instead of that force being transferred up the chain. The same for knees that bow, hips that wobble, each and every vertebra that stretches the wrong way, robbing power rather than contributing power to the drive. Stabilizer muscles at every joint along the kinetic chain stop unnecessary movement so that there is a potential to maximize force being transferred to the club head. Why Are They Important To Train? Local Power – They keep the fulcrum of each individual joint ‘centered’ properly during movement to optimize biomechanics and power of that joint. Combined Power – Having adequate strength and control of each stabilizer in your body allows you to add more cumulative power to your shots rather than robbing power from your stronger muscles. Consistent Shots – Clicking joints are a prominent sign that your joints are not being stabilized properly and could be moving unpredictably during a stroke. Loose joints are less noticeable than clicks, but have the same impact of decreased accuracy. This makes it very difficult to hit the same shot time after time. Even half a mm of extra play in a dozen joints throughout the body accumulates so that body movements are difficult to control with precision and consistency. Health – Weak stabilizers allow local joints or other parts of the body to move excessively, stretching tissues abnormally, causing damage and eventually pain. Career Longevity – Accumulated stretching of soft tissues by poorly stabilized joints leads to accelerated damage and joint degeneration that results in prematurely ending athletic careers and yoga practices. Increasing effective control and strength in a muscle is a combination of many factors including: increased muscle mass; elimination of intramuscular fibrosis & trigger points; recruitment of more muscle fibers during contraction, enhancing neurological control and coordinated timing. Prime movers will experience some improvement of these parameters through playing golf, particularly enhancing nerve control and coordination. Stabilizers rarely get conscious attention during play and typically do not get enough usage to result in significant improvement. Let’s look at a couple of the factors in muscle strength development so you can see why training stabilizer muscles in isolation and reintegrating them back into your swing can be so much more effective. Increasing muscle mass requires introducing micro-tears into the muscle so that it stimulates the body to repair the damage and make it just a little bit stronger to prevent future damage. 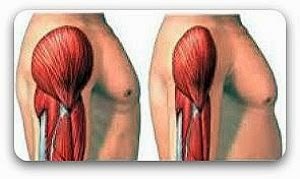 This is done by exceeding the muscle’s capacity through repetitive use of the muscle or increasing the amount of weight that the muscle is pulling against. For example, in golfing, the swing muscles are typically used only once every 3-10 minutes. This pattern does not lead to the repetitions that are conducive to obtaining micro tears that stimulate growth. Increasing resistance on the stabilizer muscles through contractions of stabilizers near their maximum output during a swing are also very unlikely to happen. The majority of force in a swing is exerted by the agonist muscles and stabilizers typically only use a percentage of their maximum potential force which doesn’t stimulate growth. Control of stabilizer muscles are frequently far from a golfers thoughts during their shot routines. It is often difficult to determine if a stabilizer is working or not, unless you isolate the movement and the muscle involved. One knee stabilizer that I frequently check involves control of rotation of the tibia at the knee. Try this on yourself. Sit with your hips and knees bent at 90 degrees. Lift one foot off the ground a few inches and dorsi flex your foot (pull your toes and foot upwards using your ankle muscles). Keep your foot in this position and without moving your thigh at all, rotate your lower leg around the axis of the tibia (i.e. 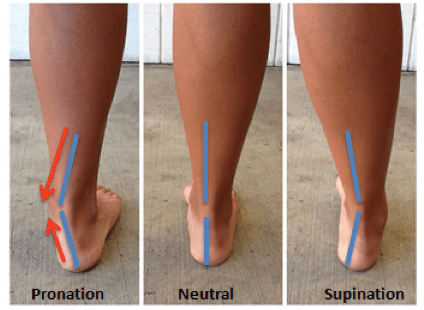 if you placed your heel on a nail sticking out of the floor and twist your lower leg so the heel stays in place and your forefoot rotates from pointing to the outside and pointing to the inside). 80% of the people I test for this stabilizer muscle have no control over the motion at all. 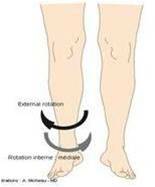 The bend their ankle but do not rotate their tibia. They do not have neurological control over the muscles that perform this motion. It usually takes 2-4 weeks to gain minimal control overs this motion and another 2-3 months to gain power and speed of movement. Without control of this movement, your knees will not be stabilized properly, will not contribute to the total power of your sport and leave you vulnerable to injury. First…..diagnose which stabilizers are too weak, which too strong and which are normal. This requires testing individual muscles. You can do this by focusing on one specific joint and testing all the muscles there and comparing them to other muscles around that joint and against the paired muscle on the opposite side. Alternatively, you can do more disseminated testing, possibly testing all the muscles in the body. Testing may be done by a number of different muscle strength testing techniques including: manual; isokinetic; tensitometry; computerized movement imaging, etc. Second….make sure that the cause of the weakness of the stabilizers is amenable to treatment by exercise. You don’t necessarily want to be exercising a muscle where the weakness is caused by a nerve, bone or other pathological problem. Third…..exercise the muscles that are weak from lack of sufficient exercise or minor traumas with exercises that target only the individual weak muscle. You don’t want to be exercise multiple muscles simultaneously, particularly if you end up increasing the strength of muscles that are already normal or too strong. Which specific exercise you do can be further refined by what aspect of the muscle you want to address. I.E. increase muscle mass, break up trigger points, recruitment, etc. Fourth….A muscle that has recently achieved significant improvements of strength may cause some shifting of stress points, neurological control and even technique requirements. Because of this step, you may need to reintegrate the muscle back into your stroke. This step is not always required. Reintegration is begun by initially deconstructing the golf swing into small components (i.e. on the downswing, a deconstructed swing might be broken into: a) push down or back on the right foot; b) rotate the knee; c) rotate the hip; d) rotate lumbars; rotate the thoracic region; drive the lead arm down; etc.). Then start reconstructing the stroke by combining the newly strengthened muscle with one of its neighbors in a subset of the swing that just includes those two joints. Exercise just those two components of the swing using proper timing, motion and then speed. Once remastered, combine the ‘new’ muscle with two neighbors. Continue in this manner, adding one new neighbor at a time, until the entire swing is reconstructed. Previous Previous post: Which muscle is not a hip rotator? Next Next post: Which muscle does not stabilize the ankle joint?